This equality, diversity and inclusion (EDI) Study Pack for Learners provides advice, guidance and practical activities to help learners better understand what equality, diversity and inclusion really means. The aim of this tool is to help learners develop their understanding, knowledge and skills around EDI and provides facilitators with a way of measuring their progress in this area. The pack will be used as part of learners' development and may be used as part of learners' induction, in tutorials and as a general reference tool for them to use throughout the year. There are two resources in this set - the Learners' Pack and the Facilitator's Pack. It is envisaged that an organisation will purchase a Learners' Pack, complete with multi user licence for the number of learners who will access the Pack (cost is just £1 per user), and a Facilitator's pack for the Facilitator (a manager or trainer) to support the learners. See foot of page for licencing details. This Equality, Diversity and Inclusion Learners pack provides learners with advice, guidance and practical activities to help them explore the key issues surrounding equality, diversity and inclusion. The Pack aims to explain apparently complex policies, practice and procedures more simply with a view to helping learners play their part in promoting equality, tackling discrimination and fostering good relationships between diverse groups. The pack includes 18 activities that will help the learners build their knowledge and skills. Some of the activities have a differentiated version for learners who require a less challenging format. Section 1: What do we mean by equality and diversity? Section 2: Why is it important? In this section of the pack we look at the four main types of discrimination in more detail. In this section of the pack we look at what constitutes unacceptable behaviour and what we can do when we witness it in the workplace. In this section of the pack we explore the reasons behind the visible differences we see between certain groups and how this understanding can help us foster better relations between diverse groups. Includes using appropriate language and terminology. In this section of the pack we look at the dangers of making assumptions about people based on what we can see. 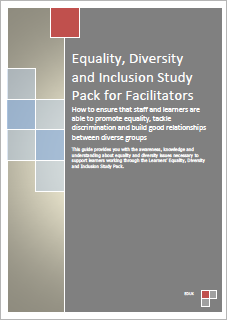 This guide provides you with the awareness, knowledge and understanding about equality and diversity issues necessary to support learners working through the Learners’ Equality, Diversity and Inclusion Study Pack. improve understanding and social awareness of why people behave differently and thus reduce the incidence of unwitting and unintentional discriminatory behaviour in the workplace and learning environment. 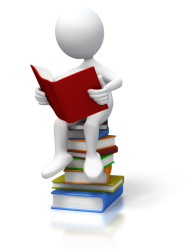 The information in the guide is supplemented by a range of activities to help you test your understanding and apply your learning to the classroom, tutorial or induction process. Many of the activities will kick start the preliminary thinking, planning and awareness raising processes you will need to embed equality and diversity into your area of work. 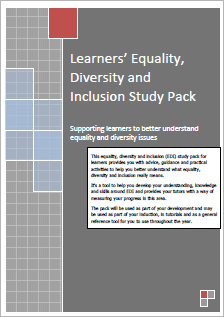 In addition, answers to the quizzes and puzzles featured in the Learners’ Equality, Diversity and Inclusion Study Pack are provided at the end of this guide. Resources for single users are distributed under our Single User Licence Agreement. If you wish to publish any of our resources on a network or intranet, there is a Licencing Cost in addition to the Resource Cost and our Extended Licence Agreement will apply.